A healthier fruit pizza full of tropical flavors, like coconut, mango, and pineapple! This version is free of gluten, grain, dairy, and refined sugar! When I was younger, my mom made this amazing dessert for a get together. It was a dessert pizza with a cookie crust, a cream cheese “sauce,” and fruit galore. It was delicious and I was in awe. This was pre-Pinterest and pre-internet (I’m definitely aging myself here 😉) so it wasn’t something I had seen before. Fast-forward several years later and fruit pizzas are ALL over the internet. They make a beautiful, summery dessert and aren’t too difficult to make either. The problem is, I had a hard time finding a recipe that wasn’t chock-full of sugar and dairy. I’m from Hawaii, so I’m infamous for wanting to put tropical twists on things. However, I currently live in Oklahoma, so unfortunately I don’t have easy access to a whole lotta tropical fruits. I used what I could find though and supplemented the rest with seasonal fruits. I was able to take out the grain and dairy using one of my favorite ingredients: coconut! I used coconut flour for the crust and coconut cream for the “sauce.” I used the can of coconut cream from Trader Joe’s, which I love because it’s pretty much all cream and very little water (I only needed one can.) You can also use regular coconut milk, but there’s usually only a little cream and lots of water, so you may need a couple of cans to get enough cream for the topping. Arrange the fruit however you want. I opted for more of an organic & scattered (a.k.a. lazy) look over the typical neat & orderly placement. I also topped the my pizza with edible flowers I bought from a nearby organic nursery, which sells pesticide-free plants. Just make sure your flowers are free of chemicals and safe for consumption before placing them on your food. This dessert is pretty easy to make, gorgeous, and healthier too! If you give it a try, snap a pic and tag me and #wifemamafoodie on Instagram so I can see your creation! Enjoy! 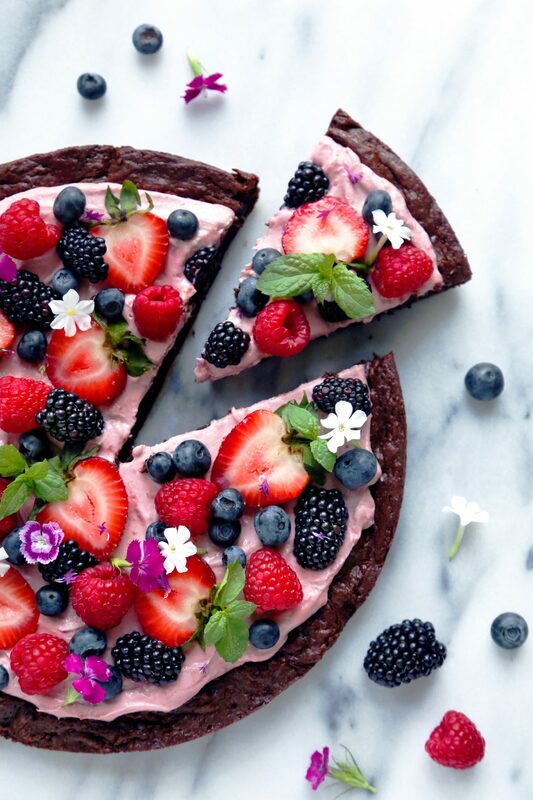 A healthier version of the popular fruit pizza! This version is free of gluten, grain, dairy, and refined sugar! Can easily be made vegan by omitting the egg and using the dairy-free alternatives listed. Preheat oven to 325F. Place coconut flour, arrowroot, and salt into a medium mixing bowl and stir together. Add maple syrup, coconut oil, egg, and vanilla and blend together. Spread mixture onto a 10 to 12-inch pizza pan lined with parchment paper and bake for 8-10 minutes or until a light golden brown. Remove and let cool completely before assembling the pizza. Make sure your can of coconut milk/cream has been refrigerated for at least several hours or until the cream and water have separated. Drain the water/liquid part of the can and use only the cold (hard) coconut cream. 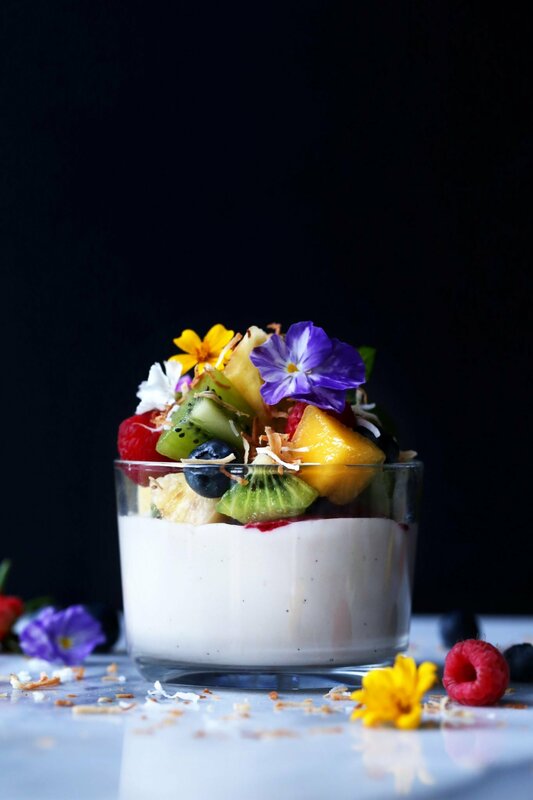 Place the hardened coconut cream into a mixing bowl, along with 1 tablespoon of honey or maple syrup (I like to use raw white honey thats a little more on the firm side to keep the whipped cream from becoming to liquid-y) and mix with a blender or whisk until fluffy. Add more sweetener as needed. Make sure crust is completely cooled before assembling. Spread coconut whipped cream over the top of the crust and begin topping with sliced fruit in whatever arrangement you like. Top with flowers or mint, if using. Keep refrigerated until serving. Makes about 8-10 slices/servings. Hi, I’m so sorry. I don’t speak French. I’ll try and use a translator. Bonjour et merci pour ce site et vos partages. Cette pizza est superbe !! Est ce une recette ig bas sil vous plaît ? Et sinon est ce que vous savez comment pourrais je la rendre ig bas? Fruit pizza is one of my favorite things to eat! This looks so good right now! Oh that looks so good! This looks like something fun I can do with my kids! Should be a great time! Oh my gosh. This was such a neat idea. I can’t wait to try this. So yummy. Thank you Sandra! Please let me know how you like it if you try it out. Thanks for sharing! The photo had me in awe right from the start and I couldn’t help but read on! I’m definitely going to try and recreate this for my family! Aw thank you for your encouragement! Have a lovely day! This looks so good! It would be perfect for summer! So refreshing, I’m sure! Yes for sure Maria! Thank you for stopping by. Have a lovely day! Yes for sure. Thank you Zan! Have a great weekend! Thanks Alexandra for pinning and your kind words! You’re so sweet! Your photography is freaking STELLAR. This is too beautiful to eat! Looks so yummy and your photos are absolutely beautiful! Aw thank you so much Tiffany! i am a HUGE sucker for any fruit pizza! this healthier version looks incredible! thanks for sharing! Absolutely loved this great and easy dessert idea!! Your blog is amazing and the photos you take are so beautiful and high quality! Aw thank you for the encouragement Maria. I really appreciate it! This is beautiful! I love fruit pizzas! This pizza not only looks delicious… but it is beautiful! Looking forward to making it… and taking it to summer potlucks! Thank you Ileana! Have a great weekend! These fruit pizzas look SO YUMMY! I want to try this recipe ASAP! I love your whole website, not just this post. Everything you do looks so delicious!!! Aw thank you for the kind words Elena! This made my day! I. LOVE. THIS. I also grew up on the typical fruit pizza aka giant cookie with fruit on top. This is an awesome alte! Thank you Lauren. It’s a family fave! That looks so good! I’d be ok if you wanted to come over and make me one right now! 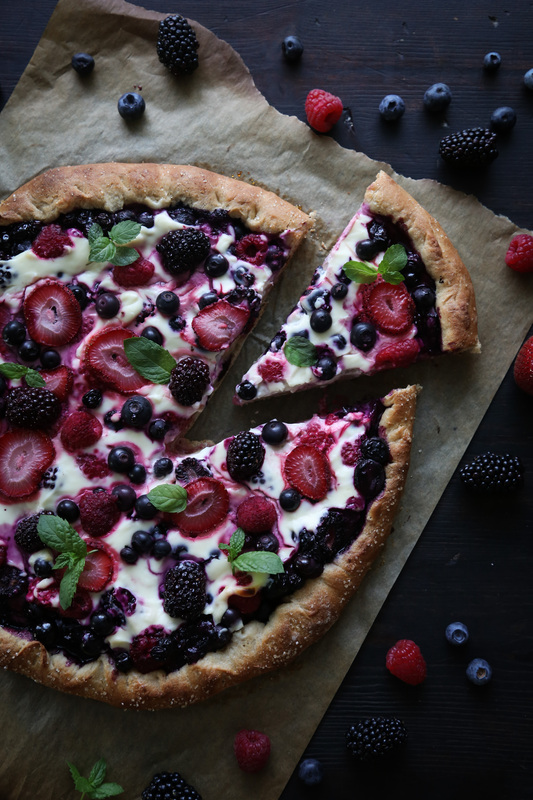 I’ve never associated pizza and fruit together but now I am interested in trying this out! Saving this post! This is almost too pretty to eat! How cute! These look so delicious! What a beautiful dessert, I bet it tastes as good as it looks! You’re so talented, Joscelyn! yes to delicious and healthy! Thank you for this recipe. Pinning now! UM, this looks insanely amazing!!! I’m so going to make this – such a good idea! This is one gorgeous pizza I have ever seen. Looks so colorful and YUM! This looks so delicious & surprisingly healthy! I used to eat this all the time as a kid too! But I’m totally not a cream cheese frosting person, so this version would have been even better even back then. Absolutely gorgeous Joscelyn! Love the addition of the flowers! Ha, I love that! Almost. Thanks for your encouragement! This look so unbelievably good! So glad fruit is back in season. Thanks, Carlen! I hope you really enjoy it! Thanks, Amisha! Don’t you just wish we had access to all the fresh fruits we had growing up? Although I enjoy making it, I must admit, recipes like these make me so nostalgic. Thanks for stopping by! I appreciate your kind words!